The US will use diplomacy and work with its partners to “expel every last Iranian boot” from Syria, Secretary of State Mike Pompeo has vowed. 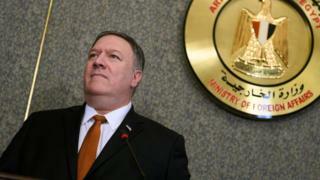 Mr Pompeo warned there would be no US reconstruction aid for areas controlled by Syrian President Bashar al-Assad until Iran and its proxies had left. He was speaking in Cairo three weeks after President Donald Trump announced US troops were pulling out of Syria. The decision shocked US allies and sparked strong criticism in Washington. Why did Pompeo mention Iran? Iran, alongside Russia, has been supporting the Syrian government in the Syrian civil war, providing arms, military advisers, and reportedly combat troops. The US is deeply suspicious of Iranian activity in the Middle East and views it as a destabilising force in the region. It is also an ally of Israel and Saudi Arabia, two of Iran’s foes. He added that American sanctions against Iran were “the strongest in history and will keep getting tougher”.